Missouri’s 2017 abortion report reveals that abortions in the state have fallen every year over the past decade. Since 2008, abortions performed in Missouri have dropped by 47 percent. *Total abortions occurring in Missouri. Missouri also reports abortions performed on Missouri residents both inside and outside the state. Information on Missouri’s state abortion rate and Planned Parenthood’s Missouri market share is not publicly available. There were 3,903 abortions reported to have occurred in Missouri in 2017 (Fig. 1). Abortions in Missouri have fallen by 62 percent from 1975, the year Missouri began reporting, and by a whopping 81 percent from 1984, the year a record 20,204 abortions were reported in the state. Abortions fell by 14 percent from 2016. Chemical abortions similarly fell 13 percent from 1,226 in 2016 to 1,062 in 2017. In 2017, chemical abortions made up 27 percent of all abortions reported in the state. The Charlotte Lozier Institute estimates that the state abortion rate was 3.3 abortions per 1,000 resident women in 2017 (Fig. 2). In 2017, there were 6,790 abortions that were performed on Missouri residents, both in Missouri and in other states (Fig. 3). 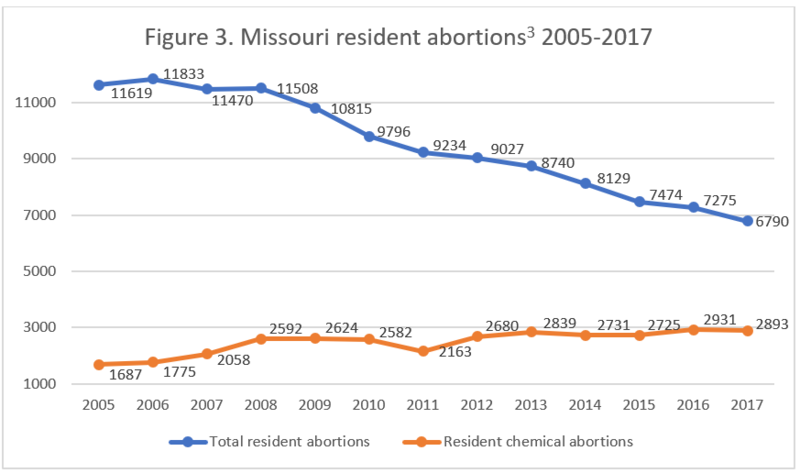 Total Missouri resident abortions declined by seven percent from 2016, while chemical abortions performed on residents fell by one percent from 2016. The true number of abortions performed on Missouri residents was likely much higher, as Illinois did not report the exact number of Missouri residents who traveled to Illinois for abortions. Including estimated Illinois abortions, Missouri reports that there were an estimated 8,577 resident abortions in 2017. Of the 3,903 abortions reported as performed in Missouri in 2017, over half (59 percent) were performed on women in their twenties. Twenty-eight percent were performed on women in their thirties, and two percent on women age 40 or older. Eleven percent were performed on women under the age of 20. Non-Hispanic white women composed the largest racial group, undergoing 47 percent of the abortions reported in Missouri. Non-Hispanic black women underwent 41 percent, and Non-Hispanic women of a different or unknown race underwent eight percent. Four percent of the abortions were performed on Hispanic women. The most common abortion method was curettage, used in 58 percent of abortions. Chemical abortions made up 27 percent of the total, and dilation and extraction was used 15 percent of the time. Forty-three percent of the abortions were performed earlier than nine weeks of gestation. A quarter were performed between nine and 10 weeks, and 13 percent were performed between 11 and 12 weeks. Seven percent of the abortions reported in Missouri occurred between 13 and 14 weeks of gestation. Five percent were performed between 15 and 16 weeks, and an additional five percent were performed between 17 and 19 weeks. One percent of the total was performed at 20 weeks – more than halfway through pregnancy, when babies can feel pain. Two percent were performed at 21 weeks of gestation or later. Missouri requires abortion providers and medical professionals to report any abortion complications they treat to the state Department of Health and Senior Services. The law went into effect in 1979, but for many years was not enforced. Beginning in 2017, Missouri started once again enforcing the complication reporting law. In 2017, there were 74 abortions that were reported to have resulted in 86 complications. Incomplete abortion was the most common complication, making up 34 percent of the reported complications, followed by failed abortion at 23 percent, retained products at 16 percent, and other, unspecified complications at 26 percent. More demographic information was reported for abortions performed on Missouri residents. There were 6,790 resident abortions in 2017, but the report does not indicate how many of these were performed in Missouri and how many were performed in other states. Ten percent of the resident abortions were performed on women under the age of 20, while 59 percent were performed on women in their twenties and 28 percent on women in their thirties. Three percent of the abortions were performed on women age 40 or older. Just over half the abortions, 51 percent, were performed on non-Hispanic white women. Thirty-six percent were performed on non-Hispanic black women and eight percent on non-Hispanic women of other or unknown races. Five percent of the abortions were performed on Hispanic women. Most of the resident women had completed 12 years of education or more. Forty percent of the abortions were performed on women with 12 years of schooling, 30 percent on women with 13 to 15 years of education, and 14 percent on women with 16 or more years of education. In contrast, eight percent had finished between nine and 11 years, and just three percent had fewer than nine years of education. Educational status was unknown for four percent of the women undergoing abortions. Eighty-five percent of the abortions were performed on unmarried women, while just 14 percent of the women were married. More than half of the women had other children. Twenty-five percent had one living child, while 36 percent had two or more living children. A smaller percentage had already had an abortion: 24 percent had one previous abortion and 13 percent had more than one, compared to 64 percent who had no prior abortions. Over half the abortions (55 percent) were performed at eight weeks of gestation or earlier. Twenty percent were performed between nine and 10 weeks, dropping to 10 percent between 11 and 12 weeks and six percent between 13 and 14 weeks. Three percent of the abortions were performed between 15 and 16 weeks, and four percent occurred between 17 and 19 weeks of gestation. There were 69 abortions, one percent of the total, performed at 20 weeks. An additional 65 abortions (1 percent) were performed at 21 weeks of gestation or later. 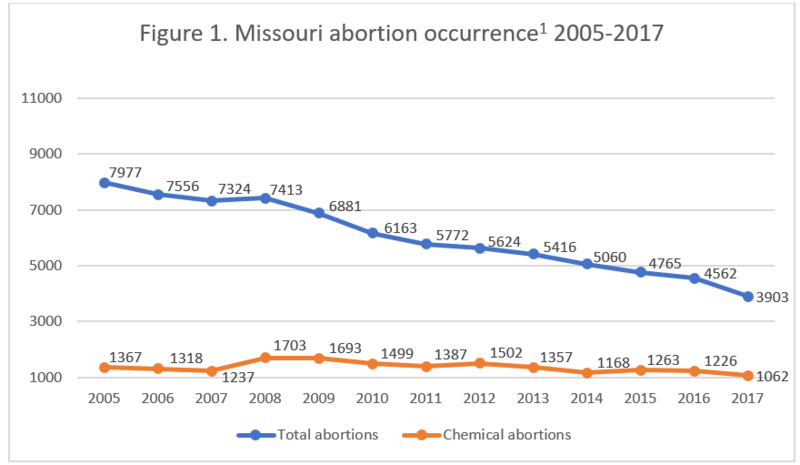 A higher percentage of resident abortions were chemical compared to all abortions reported in Missouri – 43 percent of resident abortions were induced chemically, while 46 percent were performed using curettage and 12 percent using dilation and evacuation. In 2017, Planned Parenthood (PP) announced plans to expand its abortion business in Missouri, as the Charlotte Lozier Institute noted. At the time, Missouri had a single abortion center, which is located in St. Louis and operated by Planned Parenthood. Missouri’s law requiring abortion providers to maintain hospital admitting privileges had been blocked by an injunction, allowing Planned Parenthood centers that had failed to find doctors with privileges to resume performing abortions. However, Planned Parenthood’s plans for Missouri have not come to pass. Planned Parenthood’s center in Columbia began performing abortions in October 2017 but was compelled to halt in October 2018 after failing a safety inspection. Planned Parenthood’s center in Kansas City began abortions in September 2017, but suspended abortions in August 2018 after the center’s license expired. In September 2018, the Eighth Circuit upheld Missouri’s admitting privileges requirement, allowing the law to go into effect. This is predicted to put an end to PP’s planned rollout of abortion services in Joplin and Springfield. Planned Parenthood’s St. Louis location is once again the only abortion clinic in the state. In CLI’s 2016 study that evaluated abortion reporting across the 50 states, New York City, and the District of Columbia, Missouri’s reports were tied for 25th place. Already, the Show-Me State has improved its reports by enforcing its complication reporting law and reporting complication data. Missouri could improve its reporting further by specifying how many resident abortions occur in Missouri and how many occur in other states. Missouri could also report the number of abortions performed at each facility in the state, which would allow citizens and researchers to more easily determine the impact of policies like the hospital admitting privileges law. The total number of abortions for 2011 and 2014 given in the 2016 abortion report vary slightly from the totals given in the original 2011 and 2014 abortion reports. Because the 2016 report provides updated numbers for total abortions only, and not chemical abortions, the totals provided by the 2011 and 2014 abortion reports have been used to allow for comparison with chemical abortion totals. Missouri does not report the state abortion rate. Rates were calculated by the Charlotte Lozier Institute using population estimates from the United States Census Bureau. 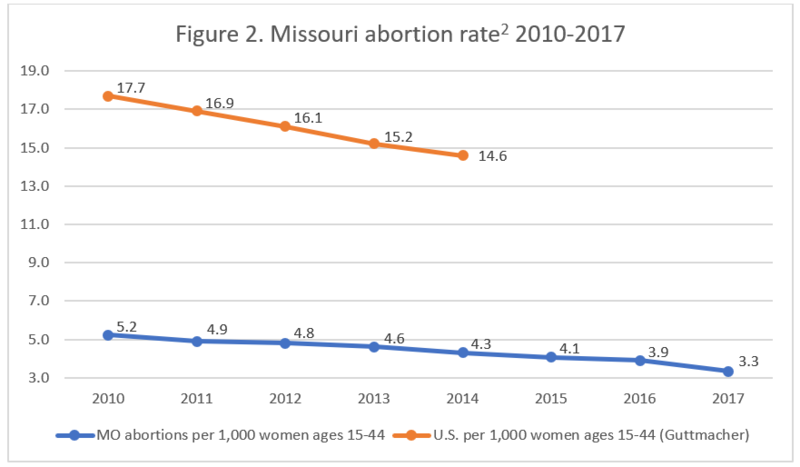 The rates were calculated using the following formula: (total number of abortions performed in Missouri ÷ number of resident women ages 15-44) x 1,000. The total numbers of abortions in the 2015 and 2016 abortion reports were used. It is unknown how many resident abortions occurred in Missouri and how many occurred in other states.